Schools used to send out messages on paper, relying on students to deliver them on time (or at all). Then SMS came along and delivery by text message improved things slightly. Smart phones and tablets are now commonplace and enable schools to communicate with students and parents in ways unimagined just a few years ago. Notifications don’t have to be confined to text any more: images can be included; and sound; and video. Notifications can be formatted to look professional and to deliver the message as efficiently as possible. Information can be attached to allow downloads at the recipient’s convenience. Answers can be requested and responses can be made easy to deliver. 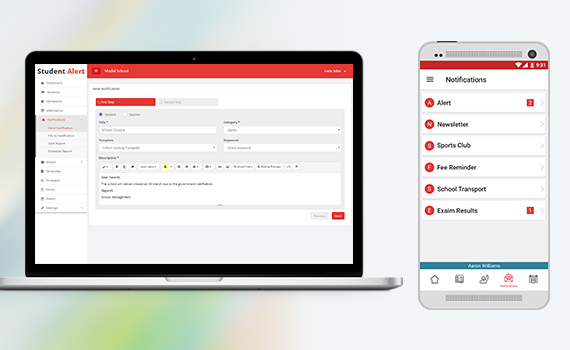 Administration staff will love the efficiency of Student-Alert. Messages only have to be created once, then they can be stored for re-use. Stored messages can be tailored for each different audience. Recipient groups can be created and saved, amended and merged or divided at will. Groups might be based on educational subject, or school class, or grade, might consist of students, parents or both. Teachers can also get involved – sending or receiving notifications about homework, or attendance, for example. With Student-Alert you get more efficient, targeted communications and save both time and money. Everybody wins!